Saturday 24 November, it was an early start for our 06:30 flight from Heathrow to Madrid but thanks to my blog for Brazil 2015 we opted for another 15 minutes in bed - in 2015 we had arrived at Heathrow particularly early and found that neither check-in nor the lounge was open. Our timing worked out well. We found a check-in desk open at 04:45 and got to the lounge as it was being opened at 05:00. The flight to Madrid and our transfer onto the flight to Quito all went smoothly. It was a long day and we ended up sleeping for a good portion of the flight. Iberia’s business section wasn’t as comfortable as BA’s and the cabin layout meant there were very few pairs of seats facing each other... but the food was fine. 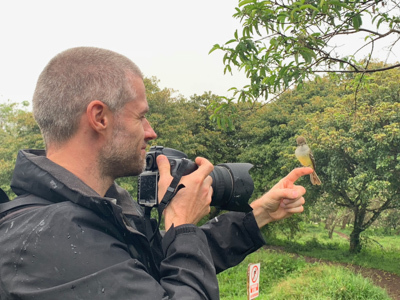 During our travels in Ecuador, and the Galapagos Islands in particular, we shot a number of video clips which I have used to create the following video. Enjoy! 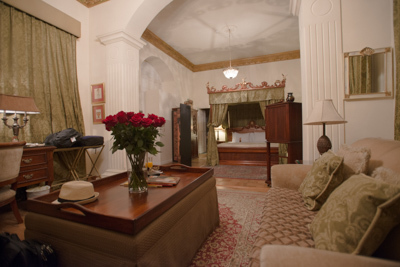 We got a taxi from the airport to Mansion del Angel where we would be staying for the next 3 nights. The whole hotel smelt of chocolate and we had quite a quirky room. We had dinner in the hotel "restaurant" but strangely had to order from the menu a couple of hours in advance! Sunday 25, following breakfast Tammay and I went for a short walk around the Parque La Alameda and then made our way down the hill to Parque El Ejido. As it was a Sunday many of the roads had been closed and there were a lot of people out on their bikes. 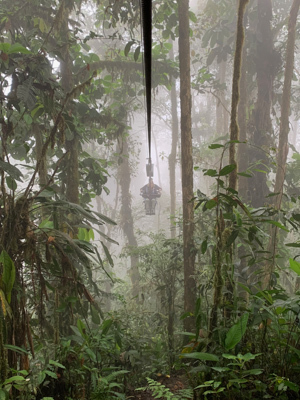 At 11:00 we met our guide Antonio at the hotel and we visited the viewpoint at Guápulo. 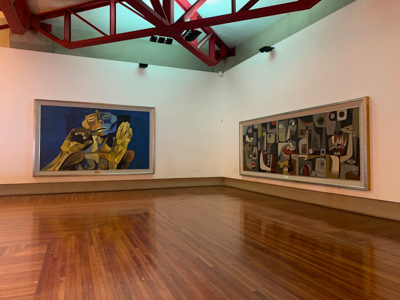 We then visited The Guayasamin Art Museum, taking a guided tour of the gallery followed by one of Guayasamin’s home. The pieces on display were really quite striking. 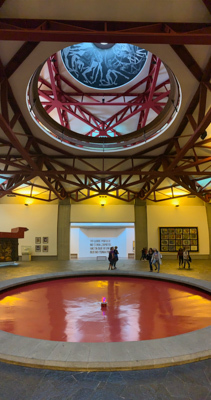 The last stop on our tour was Botanical Gardens La Carolina. Following a recommendation from our guide he dropped us off at Mama Clorinda for lunch. By the time we had finished eating a heavy rain shower had passed by and we walked back to the hotel. At 17:00 our hotel provided afternoon tea and we met Will who had travelled from the US for a break with his mum. 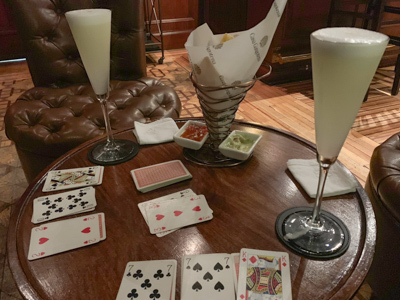 That evening we went to Casa Gangotena where we played cards over pisco sours and then had dinner. It wasn’t long before I was feeling very tired! 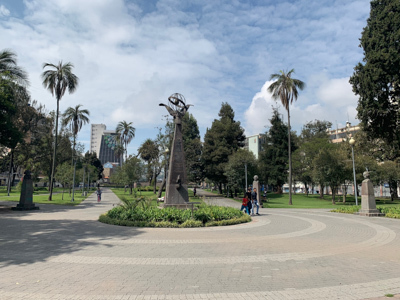 Monday 26, we again met Antonio and also met 6 other members of our Galapagos group for a full day tour of Quito. 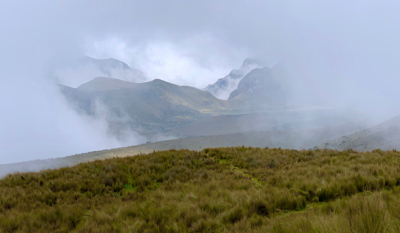 Despite the heavy cloud we all decided to take the TelefériQo Cruz Loma gondola lift up the east side of Pichincha Volcano to the Cruz Loma lookout. From the top station we took a short walk a little further up the mountain to a point where there would otherwise have been some good views of Quito. 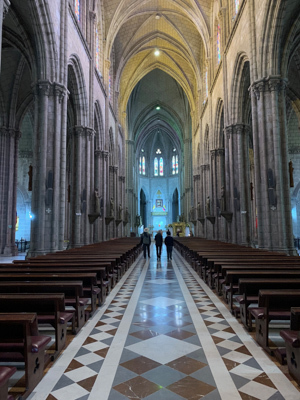 We had a short walk around in the Basilica del Voto Nacional before taking a walk around the old town and stopping at Compañía de Jesús (The Church of the Society of Jesus), a Jesuit church completely decorated in gold leaf (and a fair bit of gold coloured paint!). We went back to Casa Gangotena for lunch and afterward visited a chocolate shop where we were shown the process of making chocolate bars. After getting to taste a number of different chocolates, including one made with 100% cocoa, we bought a bar made with 80% Ecuadorean cocoa. The last stop on our tour was the statue of the Virgin Mary located at the top of a hill overlooking the town. That evening we had dinner at Zazu. The food was great and I wish I had been hungrier! Tuesday 27, an early start for a 06:30 transfer to the airport. 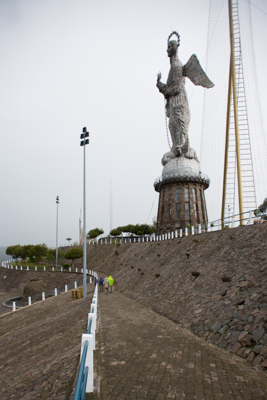 We flew from Quito to Guayaquil and then on to Balta Airport on the main island of Galápagos. Despite having experienced about 250 previous landings this was the first time I’ve had a pilot abort at the last minute. A short bus ride from the airport took us to the port where the Samba was waiting. Our quarters were small (as you’d expect), but perfectly formed. In reality we obviously spent very little time in our room. After lunch we had a welcome briefing in the boat’s dining room. The little coffee machine housed in the corner proved very popular during our adventure. 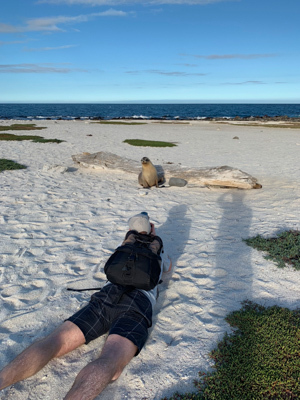 We then dove straight into the ‘day 1’ activities of our Galápagos safari with a short zodiac (or panga) ride which took us to a small sandy beach on Mosquera Island where we were able to get up close to the sea lions for the first time. Wednesday 28, day 2. Genovesa. We started the day with an early hike on which we saw numerous birds and a few sea lions. Brown and white red footed Boobies, Nascar Boobies and Frigate birds. This was followed by the first of many snorkelling sessions. 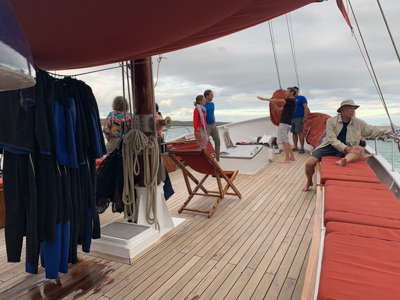 Our wetsuits and snorkelling kit was stored on-deck where we got ready for each snorkelling session. That afternoon we did another hike and saw a lot more birds. Thursday 29, day 3. Marchena. A snorkelling session where we saw a turtle. 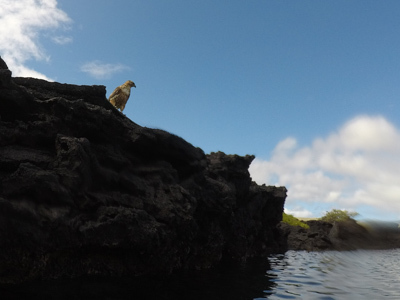 We also went snorkelling in a lagoon where we were watched very closely by a Galápagos hawk. 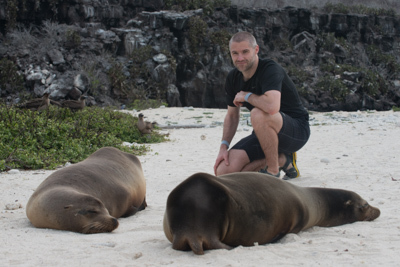 We had a number of sea lions swimming around us and also saw fur seals. That afternoon we spotted a pod of dolphins ahead of the boat. We had some rough seas crossing to our next location. The rough seas coupled with the fact that I’d overindulged on the snacks (deep-fried cheese balls dipped in maple syrup!) left me feeling rather unwell. Thankfully it soon passed! Friday 30, day 4. Isobela. 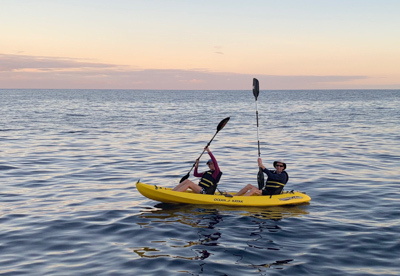 We took an early morning panga ride (or kayak) to see if we could find sea lions hunting. We saw plenty of sea lions and cormorants. 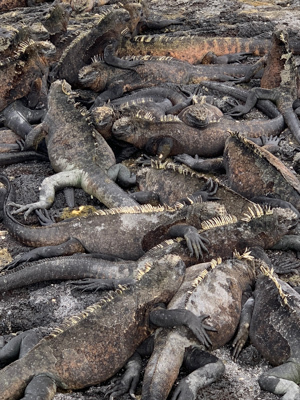 After breakfast we went for a hike to an old US naval base and found a bunch of marine iguanas resting in the sun. That afternoon we had an awesome snorkelling session where we saw more sea turtles than you could count. The bay where we had stopped was thought to have been used by the turtles as a cleaning station. There were also sea lions and penguins in the water with us! I was able to capture some great underwater video clips with our GoPro. After a quick shower we went back out on the panga to see the animals from above. We saw a lot of flightless cormorants as well as turtles, sea lions and more penguins. On our way to our next stop we saw a pod of whales and dolphins in the water ahead of our boat. Saturday 1 December, day 5. Fernandina and western Isobela. A very early wake up! We watched the sunrise from a beach that was literally covered with marine iguanas. Then went for a hike along the coast and saw loads more animals including a bunch of young sea lions playing in a small pool. 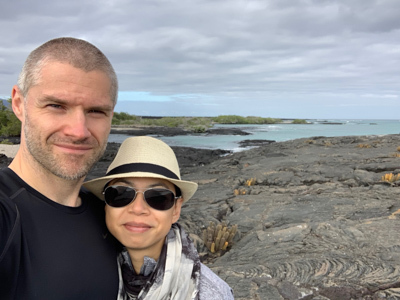 After a quick breakfast we went snorkelling to find some marine iguanas eating under water but unfortunately the water was too murky and choppy to see much. 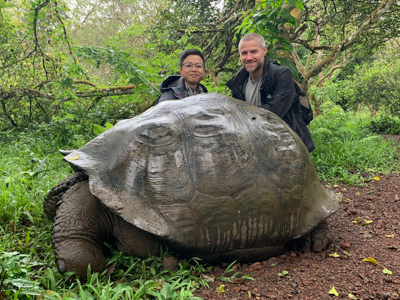 After lunch we headed back over to Urbina Bay on Isobela to find the giant tortoises of Alcedo volcano. We also saw a bunch of the yellow land iguanas (coloured to have better camouflage amongst the leaf litter). 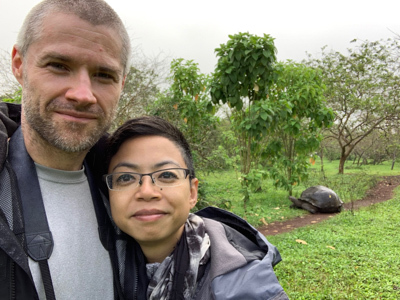 Unfortunately we also came across a dying cat (which had possibly eaten poisoned bait - cats are considered pests because they eat the iguanas) and a recently dead tortoise. Sunday 2, day 6. Isobela. Another very early wake up for a panga ride to see if we could find any manta rays. A snorkelling session had been planned to find seahorses but this ended up being cancelled. 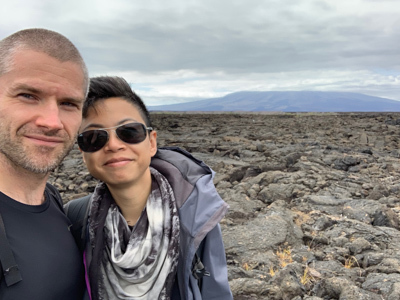 We took a walk around Punta Moreno, a seldom-visited area of lava fields. Initially looking totally barren, we soon found small pockets of life. Small patches of ‘soil’ forming from decaying plant life, natural pools and also 2 flamingoes. That evening we set out on the long and choppy passage to Floreana. Thankfully I managed to make it through the trip unscathed! Monday 3, day 7. Floreana. After an early breakfast we headed over to ‘Post Office Bay’ on Floreana. There were bright red marine iguanas getting ready for the mating season. There were also a bunch of sea lions playing along the sea wall, jumping in and out of the water. 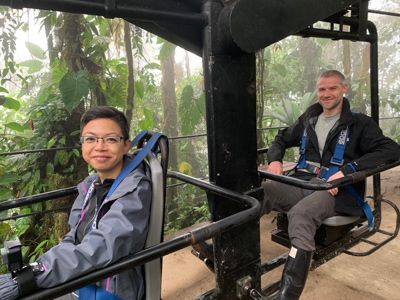 We took a "bus" up into the highlands for a walk through the trees and greenery. We saw quite a few tortoises along the path. We also came across the "Baroness’s house" and where Dr Ritter and his companion Dora lived, as described in the documentary we had watched the evening before (also described in the book "A Galapagos Affair"). The trail ended up at the labyrinth and pirates’ caves. After getting back to the Samba we sailed over to the ‘Devil’s Crown’, an old sunken volcano/island, and quickly changed into our snorkelling gear one last time. During our first swim through the middle I made friends with another playful sea lion! We also saw an octopus but were too far away when a shark and sting ray were spotted. After a quick lunch we sadly headed back to Puerto Ayorta, on Santa Cruz. We ended up following a pod of dolphins riding the bow wave of our boat, darting back and forth and jumping out of the water. The evening ended with ‘cocktail hour’ and our final dinner and night on the boat. Tuesday 4, day 8. Santa Cruz. 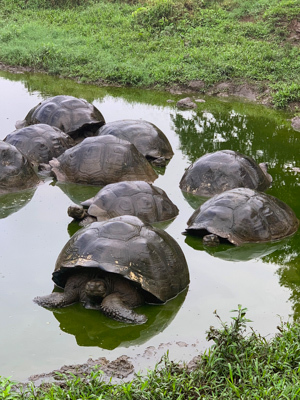 During the morning we visited a tortoise sanctuary. We saw some truly huge specimens! While taking photos of the giant tortoises a Galápagos Fly Catcher flew around my head. After simply holding out my hand it happily landed on my finger! We also stopped to look at a double caldera on the way back to the airport. After the flight back to Quito (via Guayaquil), we overnighted at the Marriott and had some drinks with Chang and Rebecca before going our separate ways. 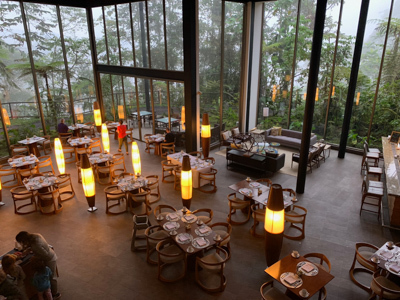 Wednesday 5, we were picked up from the Marriot and after collecting 2 more couples from Casa Gangotena we set out on the road transfer to Mashpi Lodge. Amazingly one of the couples turned out to be from the small village of Ammanford where my mother grew up. 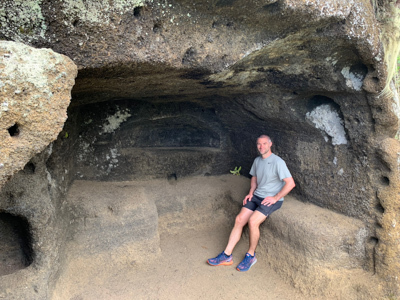 We made a brief stop at Tulipe (an archeological site). After settling in at Mashpi Lodge the 6 of us in our group made the short walk to the "Life Centre" with Nestor as our guide. 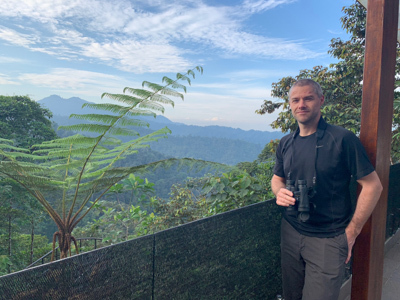 With bananas used to entice the wildlife we saw a number of different bird species plus an Agoutis and a Tayra (from the otter/weasel family). This was followed by a walk around in the butterfly house where we were shown lots of different species at each of their life stages; eggs, chrysalis, butterfly. 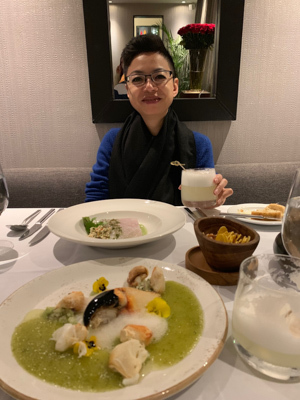 Each evening the lodge held "happy hour" from 18:30 and Tammay and I couldn’t resist a Pisco Sour. At 19:00 we took our drinks to a short presentation on the wildlife around Mashpi given by one of the guides. A Wester Olingo was spotted in Mashpi for the very first time the day before we arrived. Thursday 6, before breakfast we went out on the lodge’s terrace to admire the views. After breakfast we took the Dragon Fly from the lodge and completed 3/4 of the circuit which took us to Tower 4. 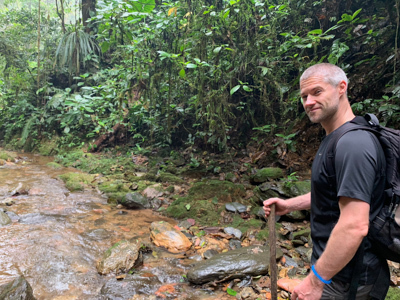 From there we made the short hike down to the river and to the Glassfrog Waterfall. I was the only one brave enough to join Nestor in the cool water! We then completed the rest of the circuit on the Dragonfly which took us back to the lodge. 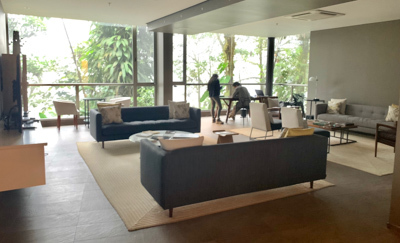 After lunch Tammay and I lazed on a recliner with great views out over the cloud forest. That afternoon we took the short drive to the Hummingbird Centre where we were able to see lots of varieties visiting the feeders. Both an Agouti and a Tayra also put in appearances. After getting a couple of pisco sours from the bar we went to a short presentation on the animals that have been seen with the camera traps around Mashpi. That evening we took a short night hike and saw a number of creatures including frogs, snakes, and a tarantula spider. 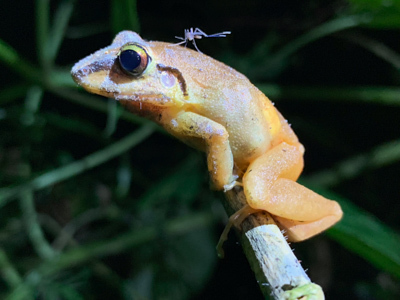 I was quite impressed with this photo of a frog I was able to capture with my new iPhone XS. Friday 7, our last full day. During the morning we took a relatively easy hike down to the Magnolia Falls. 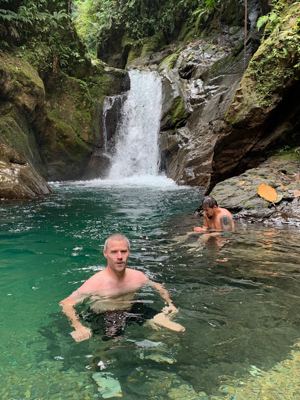 The pool at the base of the falls was somewhat smaller than at the Glassfrog Waterfall and I didn’t bother going in. From the falls we hiked along the stream to Tower 4 where we completed another 3/4 circuit on the Dragon Fly to get us back to the lodge. There were marked trails all around the property. The steep sides of the many valleys meant there was a lot of climbing required. 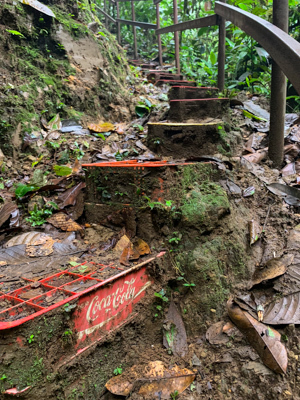 The owner of the property had decided to buy old soft drink trays and use them as a cheap way to create long-lasting steps. After lunch we took a ride out on the ‘Sky bike’ along a 200m track across a narrow valley. On the way out I had to carefully control the pedals to ensure we didn’t speed out to the middle, while on the second half I had to work the pedals a little harder to complete the ascent. 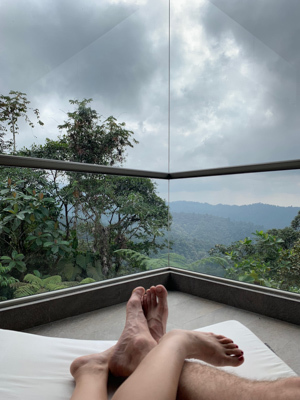 Lookout over the cloud forest? We climbed the lookout tower but the weather meant there was minimal view from the top. To finish our afternoon we had a short presentation on moths and butterflies from a researcher working onsite. During the evening we met Nestor, Steve & Nancy at the bar and enjoyed a couple more Pisco Sours. 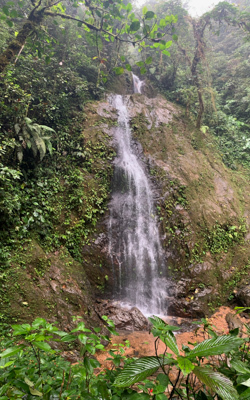 Saturday 8, on our final morning we made the slightly shorter hike to the Copal Waterfall. By 11:00 we were ready to board the minibus back to Quito but found a private transfer waiting for us, possibly because they thought we were going back to the Marriot. By 14:30 we had already arrived at Quito airport but had to wait half an hour before we could drop off our bags. We were on the 18:45 flight back Madrid where we transferred on to Heathrow.